Mike Sellars is on a mission. As the new executive director of the Public Employment Relations Commission (PERC), he wants to make the organization more efficient and more transparent. In that way, he says, PERC will more effectively fulfill its role of minimizing disruption in the public service through providing an efficient dispute resolution service. He also wants the world to know about success stories that show that collective bargaining works and that it helps to improve, not hinder, relationships between employers and employees. 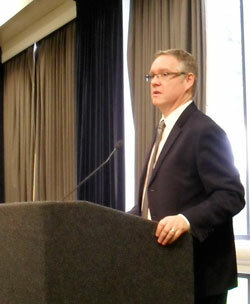 “Collective bargaining is not a roadblock to progress, history will show it has been a path to progress,” Sellars said. Speaking at a workshop held at the Legislative Weekend in Olympia in late January, Sellars said when people have a negative view of collective bargaining and its effectiveness it is often because they are quick to recall times when it has been an adversarial relationship and certain groups pillory one another. “When you lambast an employer it might or might not be called for, but that is what people remember. They recall those quotes when someone is calling someone the worst person in the world. “You might have to have a dispute, but you still have to have a relationship. Sellars set out several objectives that he would like to achieve at PERC to make it more efficient and thereby reinforce the effectiveness of collective bargaining. • To make PERC more transparent and its rules clear. “We have to be clear to help you and employers understand the right way to do things,” he said. “Are we really saying what we mean? If people don’t understand the decision, the decision is not clear. If we are regulating yet no one understands what we are saying and the same disputes keep coming up, we are not doing a very good job. • To make the case process more user-friendly, which might entail doing things differently. “Sometimes doing things the same way you have always done them provides comfort and a degree of stability,” Sellars said. “But for us it is probably time to look at where we should be doing things differently. • To make the website a more effective tool. • To encourage more feedback. • To be more timely. • To reduce the case backlog. “The backlog is better than it has been, but it is still not good,” Sellars said. For example a year ago, the commission had a backlog of more than 30 appeals pending before it. Now, that backlog is down to 21 appeals.